For Russians, it was yet another dramatic confrontation which played out in the streets of Moscow, one which marked the growing frustration many people had with their elected President. The constitutional crisis of 1993 was a political stand-off between Russian President Boris Yeltsin and the Russian Parliament that was resolved by military force. The relations between the President and the Parliament had been deteriorating for some time. The constitutional crisis reached a tipping point on September 21, 1993, when Yeltsin aimed to dissolve the country’s legislature (the Congress of People’s Deputies and its Supreme Soviet), although the president did not have the constitutional authority to do so. 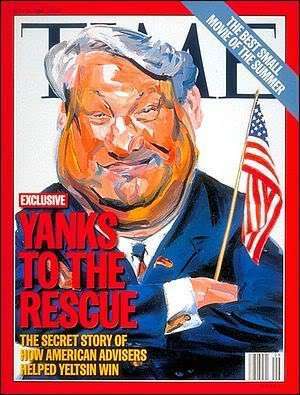 Yeltsin used the results of the referendum of April 1993 to justify his actions. In response, the Parliament declared that the President’s decision was null and void, impeached Yeltsin and proclaimed Vice President Aleksandr Rutskoy to be acting President. The situation deteriorated further on October 3, when demonstrators removed police cordons around the Parliament and took over the Mayor’s offices and tried to storm the Ostankino television center. The army, which had initially declared its neutrality, under Yeltsin’s orders stormed the Supreme Soviet building in the early morning hours of October 4, and arrested the leaders of the resistance. The ten-day conflict became the deadliest single event of street fighting in Moscow’s history since the Revolutions of 1917. According to government estimates, 187 people were killed and 437 wounded, while estimates from non-governmental sources put the death toll at as high as 2,000. Wayne Merry, who was assigned to Embassy Moscow during the crisis, discusses the nature and role of this crucial moment for post-Soviet Russia. He recounts his frustrations with the condescending tone of the Clinton Administration toward Russia, the shooting of an American Marine, the surprising lack of attention Washington paid to the crisis, and criticizes leadership in Washington for not understanding the lack of popular support for Yeltsin and reform. He was interviewed by Charles Stuart Kennedy starting in February 2010. Read also about the August 1991 coup against Mikhail Gorbachev, the fire at Embassy Moscow and when it was microwaved. My problem as head of Political/Internal was to communicate that Yeltsin was only part of a broader political dynamic in Russia, which was, curiously enough, still a democratic political dynamic. The legislature may have been a holdover from Soviet times, but it was an elected legislature, just as Yeltsin himself had been democratically elected. This political dynamic reflected pluralism and the many conflicting interests within Russian society, often not committed to Yeltsin either as a leader or to his policies. The new Clinton Administration engaged in unthinking, uncritical support for “Boris”—not even Yeltsin, it just became “good old Boris.” Washington wanted Russia to be democratic but for its leader to rule by decree. This was not, I thought, a very sophisticated or nuanced approach to dealing with a Russia that was going to have very serious internal political difficulties. One thing I found curious and off-putting about the Clinton approach was this use of first names, to refer to the president of Russia by his first name. In Russian terms you could refer to him as Boris Nikolayevich, which is perfectly respectable. You could refer to him as President Yeltsin or just as Yeltsin. But to refer to him just as “Boris,” and to do that quite openly and publicly, had a distinctly condescending quality. Clinton tended to condescend to Russia in ways Bush had not. The public speeches Clinton made in Moscow made me wince. At the start of the year, Yeltsin was in a depressive funk. Yeltsin as a personality was definitely manic-depressive and had occasional depressive periods, but he tended to come out of them with bouts of manic energy. This happened in the late winter when his opponents in the Supreme Soviet attempted to impeach him. This was an interesting concept. There isn’t even a word in Russian for “impeachment.” They used the English word and concept, impeachment, because such a thing had no precedent in Russian history. The notion that a chief of state could be removed from office through legal means obviously is not very Russian. This standoff between president and parliament progressed into March and could very easily have become violent – indeed, I expected it would – but did not for two reasons. First, the opposition retreated in real fear from an open and direct confrontation with Yeltsin, which they knew they would lose. A vote to impeach the president failed; though it is impossible to say what would have happened had it passed. Second, Yeltsin came up with an alternative. On television he proposed a national referendum on four questions. This referendum in April was about the direction of national policy and the authority of the president, and was pushed by the government under the slogan “Da, Da, Nyet, Da,” meaning they wanted people to vote “Yes, yes, no, yes” on the four questions. The idea behind the four-part referendum was to create public pressure and momentum for a constitutional convention, to rewrite the Russian Federation constitution from the relic of the Soviet period which was still the legal framework of the country. This was, I thought, a brilliant stroke by Yeltsin. It avoided what might otherwise have been a very destructive confrontation; whether an effort at impeachment by the Supreme Soviet or direct rule by Yeltsin himself. It had the advantage of going back to the people, of transcending the existing constitutional structure through direct democracy in a national referendum. Initially, the scheme worked pretty well. The opposition was flustered and could not unite on a tactical response. The government won the vote with sufficient majorities to achieve credibility for a constitutional drafting convention, which began in the early summer. Then, characteristically with Yeltsin after a fight, the momentum slowed and his leadership lost dynamism. 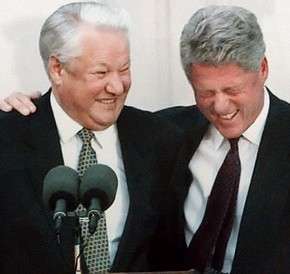 Whenever Yeltsin was in an overt confrontation, whether in late 1992 or earlier in ’91, or later in ’93, or in this particular confrontation in February and March of 1993, when Yeltsin was in a battle, he was in his element. But in the follow-through — the detailed political effort required for a constitutional convention to create a new basic law and get it put into place — his attention wandered and the whole thing lost momentum in the summer. Yeltsin was always a great fighter, but not a patient and detailed political in-fighter. This concerned me because I had said to Washington, in my cable of November of the previous year that the underlying Russian political crisis would have to be resolved, either with the reformulation of constitutional structures by peaceful means or by violent confrontation. The dilemma could not go on for an extended period. The dissipation of focus in the middle of ’93 was worrisome. It was compounded, at the end of the summer, by a terribly ill-advised currency reform, when the Russian government withdrew a massive amount of currency from circulation. This created public panic during the height of the summer vacation season, when people didn’t know if their money was going to be worth anything, if they could pay their holiday bills. By the middle of 1993, Russians were beginning to feel they were over the worst that they were over the hump that things were beginning to improve, and people were beginning to see what you might call a light at the end of the tunnel. Then came these macroeconomic stabilization measures that just knocked the support out from under the basic livelihood of much of the urban, blue-collar labor force. In my view, this was unnecessary and certainly politically very foolish. Yeltsin was already looking toward another national referendum on a new constitution and to elections for a new legislature. To manufacture a major deterioration in working class living standards in preparation for such elections showed the arrogance and political blindness of many of the so-called Westernizers and economic reformers. I dwell on this because many people think the confrontation between Yeltsin and his parliamentary opposition in late September and early October was about personalities and came out of nowhere. 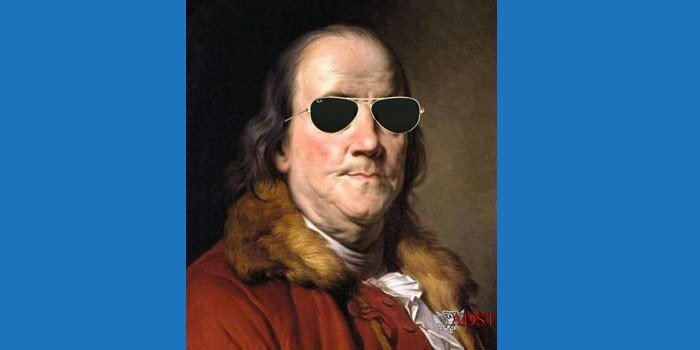 Washington saw the confrontation as a morality play, of good guys versus bad guys. This is false. The confrontation had a long and deep context. Yeltsin was always a controversial figure, even during his greatest days in 1991, but this confrontation involved a chain of events including the expiration of his emergency powers at the end of November ’92; his capitulation on large elements of policy to the Supreme Soviet in December of ’92; the replacement of much of his government; his decision, in February of ’93, to challenge the legislature again; the failed effort at impeachment that followed; the spring confrontation that resulted in the four-part national referendum; the constitutional drafting process and its loss of momentum; the currency reform, and the fiscal tightening measures. These all created an environment in which the underlying dilemma of Russia’s constitutional structure came to a head in the second half of September of 1993. The world remembers the images on CNN of the violent confrontation in Moscow in early October, but that was the culmination, if you will, of something that had been in process for over a year, and had been more or less unavoidable for months. I think violence could have been avoided, but the basic political confrontation could not. There was a lot of history — including personal history among the participants, of course — so that at the end of September, Yeltsin’s own vice president, Alexander Rutskoy, was on the other side of the barricade. The parliamentary speaker, Ruslan Khasbulatov, was on the other side of the barricade. The head of the constitutional court, Zorkin, was on the other side of the barricade. People who had been working very diligently in the summer on constitutional revision, like Oleg Rumyantsev, ended up on the other side of the barricade. These had all been Yeltsin’s allies earlier. The step which provoked the ultimate confrontation was Yeltsin’s. He became frustrated, impatient, fed-up with what he saw as the lack of progress on constitutional reform. After a series of political maneuvers, Yeltsin decided to prorogue the legislature. He lacked the legal authority to do so, but did it anyway. He went on television and dismissed the legislature with a call for new elections, plus the writing of a new constitution and a referendum on it, which in theory was what they were working toward anyway. But he decided, on September 21, to short-circuit a process he saw not going where he wanted or as quickly as he wanted. 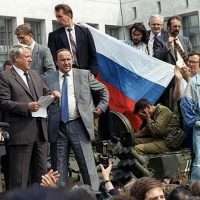 To Yeltsin’s surprise, I am sure, the opposition, if I can use that broad term, decided to take a leaf from Boris Yeltsin’s own book from August 1991 by rallying their forces to the same place he had rallied his forces then, which was the Russian White House, the seat of the Russian Parliament. The Supreme Soviet voted to declare Yeltsin a traitor and Rutskoy as acting president. 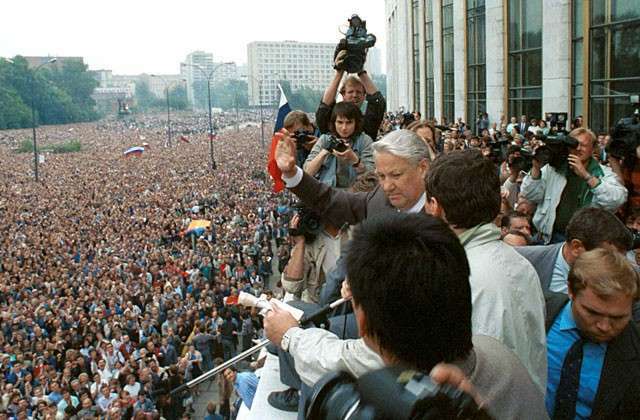 The ability of the opposition to rally large numbers of people to the Russian White House, with its important symbolism from August 1991, very much caught Yeltsin by surprise. The crowds around the White House in 1993 were not the youth of 1991, but they were more or less on the same scale. He held off using riot police or troops, hoping his opponents would lose heart or lose face or at least seek a compromise with him. None of those things happened. 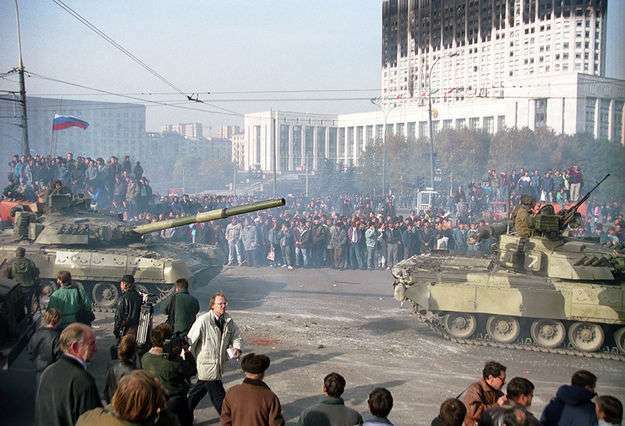 The anti-Yeltsin forces remained steadfast and even grew in numbers and determination. They saw this moment as their opportunity either to reject the Western-oriented policy of the government or to establish genuine constitutional legitimacy, depending on their point of view. Compromise was not in the air. There was plenty of political rhetoric, none of it very productive, which extended from September 21 into early October…. We were much less activist this time and certainly not seen as friends within the White House. Indeed, there came a point when even our normal contacts became difficult to maintain due to the general hostility we faced. 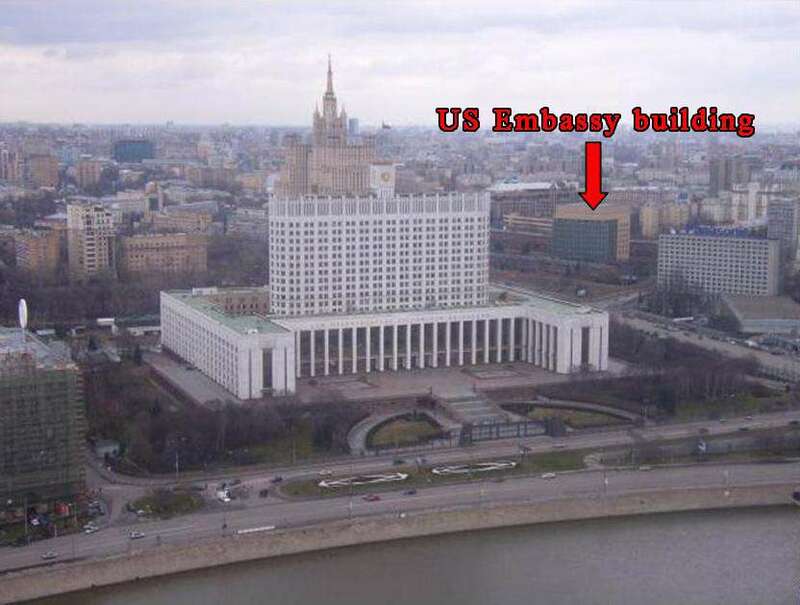 The embassy was in a very insecure location because it faced directly toward the Russian White House with only the low compound wall for protection. 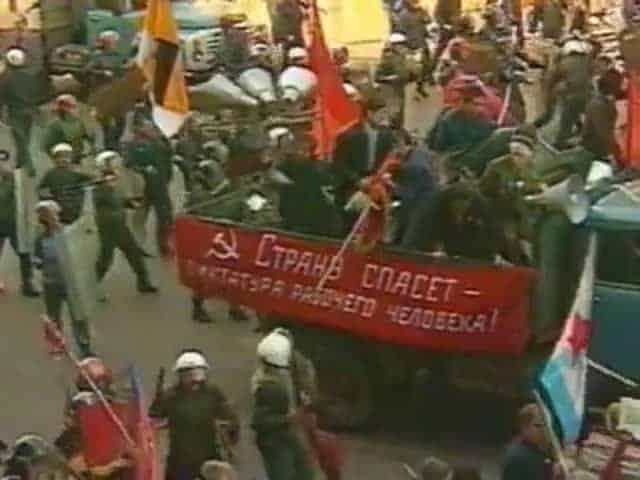 In contrast to August 1991, there were a lot of people in the crowd with guns of various kinds.…Our access to knowledgeable contacts during this Russian crisis was a fraction of what we had had in 1991, on both sides. The Kremlin was not saying very much, in part because they really did not know how things might develop. We had people covering the crowd outside the White House and talking with contacts inside, but this got to be dicey. Talking to Americans was not popular in the White House, as it was clear the United States supported Yeltsin. The mood of the crowd sometimes was pretty ugly and potentially threatening toward embassy staff. At one point, I pulled some people back for their own safety. I often had little to report other than rumors, but that reflected the fact there was little real news from either side. The adversaries were talking past each other and both were trying to wait the other out. The Moscow public was sitting on the sidelines, just hoping for a peaceful outcome. At the end of ten days, we were into the first weekend in October, and things at least appeared to be moving toward a resolution. Russian Patriarch [of the Orthodox Church] Alexy had been on a trip to the United States when the crisis occurred and had cut it short to return to Moscow. He then started mediating high-level political talks at the Danilov Monastery. This mediation process was really the first ray of hope for a peaceful end of the crisis, as both sides were at least willing to take part given the prestige and stature of the patriarch. I had considerable respect for Alexy and knew that neither side would want to appear to rebuff his peacemaking efforts. So, it looked like things might yet sort out or at least remain calm during the mediation talks, but as there was little news emanating from the Danilov Monastery, there was little for the embassy or for me to do but wait…. This being a Sunday and a day when the confrontation was supposedly in abeyance because of the mediation effort, it looked to me to be a good day to go home and get some change of clothing and take care of a few personal things. It also happened to be my birthday. I thought, “I’ve been working 18 hours a day for the past 10 days; maybe I can take this Sunday off and go home.” Well, it didn’t work out that way. My apartment was in a high-rise building which overlooked October Square, one of the main traffic interchanges in Moscow and also, at its center, site of the largest statue of Lenin in Moscow. Representatives of both sides were engaged in the mediation effort, while Yeltsin and other senior members of the government had decided to do what I did, which was to take this Sunday off, as they were mostly at their dachas. With nobody in charge locally on either side, people on the street took events into their own hands. 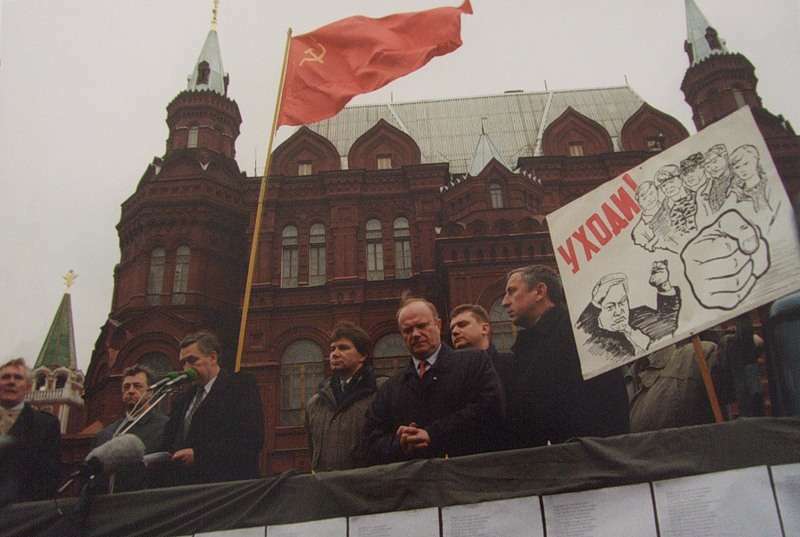 There was a demonstration scheduled for October Square in front of the Lenin statue to rally people opposed to Yeltsin. In principle, this should have been a normal peaceful manifestation of political opposition to the government, and it could have been. The problem was two-fold: first, many of the people who showed up for this demonstration were in a very foul mood after 10 days of confrontation. Many of them had been camping out around the Russian White House for days, if not a week or more, and some were looking for a fight. Unfortunately, they got it because of the second factor. The Ministry of Interior behaved stupidly. Rather than let this demonstration take place and let people vent their anger, they decided to send in riot cops to break it up. What they sent were a bunch of young, inexperienced, semi-trained riot cops who really didn’t know what they were doing. As it happened, my kitchen looked right down on the square and on the demonstration. I had a panoramic view of the collapse of peace. The riot police, instead of standing to the side to let the demonstration take place or keeping it where it wouldn’t interfere with traffic, closed in on it from all sides. They compressed the demonstrators, which was foolish beyond belief. They didn’t try to push them off in one direction. They actually pushed in from various directions. I had not the faintest notion that this relatively local event I had witnessed spelled the collapse of political peace in general. If I had, I would have returned to the embassy immediately, rather than just reporting what I had seen by phone. It did not occur to me that this event would spark others and lead to a loss of government control in much of the central part of the city, but that is just what happened. The demonstration – now a full bore riot, in my view – started moving up the street, what’s called the Garden Ring, in groups to the area in front of Gorky Park, across a bridge over the Moscow River, and then on toward where they had come from, which was the Russian White House. On the way they engaged in increasing levels of violence, particularly when they got to the square in front of the Foreign Ministry. By the time they got back to the Russian White House, and of course to the American Embassy, the police forces on the street had disintegrated, and, for the most part, simply fled for their own safety. There obviously was a lack of leadership and organization on the police side on this Sunday afternoon. Most of the senior people were at their dachas. Some of the Russian police who provided security at the entrances to our embassy actually had to take refuge inside to keep from getting beaten up by the crowds. At this point much of central Moscow on this Sunday afternoon belonged to the opposition. It was really messy. It illustrated one of those things Russians are always telling you, that Russian society is either strictly controlled or it’s anarchy. Russians, particularly elite Russians, often justify the authoritarian nature of Russian government on the argument that, without a strong hand, Russians will just descend into chaos. In this instance, the analysis was valid. I saw it happen, though I do not assert this was uniquely Russian behavior. During the course of the afternoon any kind of organized government control disappeared. The demonstrators took over the part of the city centered on the Russian White House. They had most of the major streets in that district in their hands. They decided to commandeer vehicles and go north to Ostankino, where the main television broadcast tower and production studios are located. There was a violent confrontation with police at Ostankino, but the government never lost control of the airwaves, which was very important. By that time, the government started to get its act together and sent forces to the television complex. I reported to the embassy by phone what was happening – because my kitchen was a prime vantage point – and learned that things were much worse than I had thought. The embassy faced a real security problem, because the embassy complex, which included something like 155 residences of families with kids, was right in the middle of this urban battle zone. The exterior perimeter wall had been deliberately built not very high so as not to be intimidating. It was only about eight feet high, or nine feet high at the most, and energetic, athletic demonstrators could get over that wall. If, as seemed almost certain, a large-scale battle between government forces and opposition forces was impending, the embassy would be right smack in the middle of it, much more so than in August 1991. In 1991, nobody would target the Americans, whereas in 1993, most of the opposition forces regarded the United States as being deeply in bed with Yeltsin, as being Yeltsin’s principal foreign support. The hostility towards the United States among some opposition figures was quite extreme. So there was a real chance the embassy could be in danger, or even physically overrun, which would not have been difficult. The very worst moment of this period, for me, was when word came over our radio net that one of the Marines had been shot. We did not know how bad he was, but the fact one of our Marines was hurt sent a chill through me. I recall vividly the sick feeling I had at that moment. However, we had done our job, reporting that significant armed forces were on the outskirts of Moscow and would come in pretty much at first light. Once we had properly communicated to Ambassador Pickering and Washington, it seemed to me the rational thing to do was get some sleep. I tried to encourage all the members of the team to do the same. I couldn’t get them to go to bed because they were just glued to the television in these events. For me, I decided it had been a long week and a half already and God knew what tomorrow would be like and the days after that. So, I went to one of the guest bedrooms and went to bed, went right to sleep. I suspect I may have been the only adult in the embassy who got a good sleep that night. What woke me was the reverberation from the first 120-millimeter tank cannon round being fired into the upper floors of the Russian White House.…This was a long-barreled tank gun. 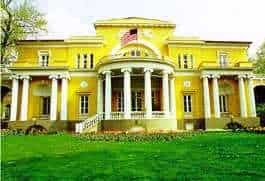 In any case, the reverberation from a 120-millimeter tank gun, fired from almost two miles away, shook the windows of Spaso House [the U.S. Ambassador’s Residence, at right]. That’s what woke me up. I found out what was going on, had enough sense to take a shower before I got dressed, knowing this was going to be a long day, and then we had little else to do than watch on television what the world was watching on CNN. The world saw only a very limited part of what was going on. While the visual imagery of that day is of tanks firing into the upper floors of the Russian parliament building, the real fighting was out of sight of the cameras. There was a large-scale battle underway on the streets between government forces and opposition. This battle zone was fairly extensive, about two and a half miles wide and maybe a mile and a half deep. 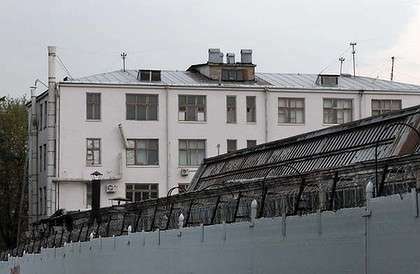 The center of the battle was on the north side of the Russian White House, in an area partly between the Russian White House and the perimeter wall of the American Embassy compound. There’s a large park and a soccer field north of the White House and across the main street from our compound. That’s where the biggest battle was going on. The government forces used the soccer field as a staging area for an assault on the building. The tanks were firing from the south into the upper floors of the White House to suppress sniper and automatic weapons fire from windows on the north side. The tanks were maybe a quarter of a mile away on the other side, and were firing high-explosive rounds into the upper floors of the tower of the Russian White House to suppress that fire. The tower of the Russian White House is wide east-west but is quite shallow north-south. It’s only maybe 80 or 100 feet deep. If they had used armor-piercing rounds, the shells would have gone all the way through the building and out the other side. As the government forces closed in on the Russian White House, various opposition elements moved off in other directions. By establishing the alternate embassy at the Ambassador’s residence, we had made ourselves, if anything, potentially more vulnerable than the people in the embassy compound, because the Ambassador’s residence was a wide-open piece of property with no security at all. We had no Marines. The gate was open. Soon, armed figures were moving around in the garden. It was hard to tell who was who, because when you see a guy dressed all in black with a ski mask and an automatic weapon you have no idea who the hell he is. The American flag was flying on the flagpole from the front of the building. I wished I’d had enough sense to take that down during the night but I hadn’t thought to do so, and it made us rather conspicuous. There were also snipers operating from balconies on high-rise buildings in the area. At one point, we were gathered in refuge in a basement room when several guys in black ski masks started looking through the window into this basement room. We quickly shifted our refuge to the attic of this 1912-era building. I doubt more than a handful of people have ever been in the attic of the Ambassador’s residence in Moscow. But it seemed to be the safest place to go for a while. By 1993 the opposition had plenty of weapons. There was no lack of small arms firepower on either side. At this point, we in the Ambassador’s residence were actually in greater physical peril than the people in the main embassy. This was a nasty irony. The lesson was that we should have established the alternate embassy at what’s called the “near dacha,” a little weekend place we have that’s inside the city of Moscow but far enough away that we wouldn’t have been at any risk. Once the battle had moved away from the White House, the embassy had to evacuate us, as if they did not have more than enough to worry about. The Ambassador’s vehicle was an armored limousine, and our Regional Security Officer came to rescue us. This was a superb guy who had come to Moscow from an assignment in Beirut and knew difficult security situations very well. The vehicle had to make three trips to get us all out. Pickering (pictured) came over on the first run to get some things, but soon returned to the embassy. I forget exactly how many of us there were, but it took three trips to get us all out. After the first trip, the opposition forces in the area understood what was going on, that an evacuation was underway. For the second run, the one I was in with the Ambassador, there was a lot of automatic weapons fire at the gate. Initially, we couldn’t get out the gate to the street. After communications by walkie-talkie with the embassy and then with the authorities, the Russian security forces nearby used automatic weapons to suppress hostile fire at the gate. We went out the gate pedal to the metal, across the plaza, and down the street, and finally into the embassy, which was surrounded by what looked like a battle zone. There were burning buildings and burning automobiles and burning debris, the detritus of an urban battle. We all got safely out of the Ambassador’s residence, which I’m happy to say was not damaged. I then learned the embassy the previous evening had started something which we had never really thought about for Moscow: emergency destruction of classified material. Most vulnerable embassies are supposed to maintain a relatively small amount of classified materials, so an emergency destruction can be done within a certain specified period of time. Something much more serious was the injury to one of our Marines by gunfire. Corporal [McClain] Bell, a young Marine, was a very popular guy, much loved by embassy kids who regarded him as a collective big brother. He was in an observation post on top of the new office building, which was still unoccupied. He was shot through the neck, perhaps by one of the government forces who had no idea what they were shooting at. There was nothing on the compound to identify it as the American embassy. We didn’t have the flag out. Most of the troops brought in by the government didn’t know the city of Moscow. This was just another building, and they saw a guy in a helmet and uniform on top of a building and somebody shot at him. He was nearly killed. Our embassy doctor took care of him, and we received, I’m happy to say, good cooperation from the Russian authorities in evacuating him to a Russian hospital and saving his life. Despite the hugely important political events taking place around us, I suspect that for many of the Americans involved, the shooting of Corporal Bell is the most painful memory of those days. The embassy didn’t really do much in terms of reporting that day because Ambassador Pickering had given orders the previous day that everybody who was not in the embassy compound — and most embassy personnel lived somewhere else — were to stay at their residences. People were not to go out and observe what was going on. They were not to engage in reporting activity. People were to stay away from the battle zones. As the hours passed, I maintained communications to Washington, which mostly meant telling people things they should already have known, answering obvious questions repeatedly. The one thing of value I contributed — other than that somebody had to be on duty that night — was my concern about Corporal Bell. After it was clear he was out of danger, I tried to get somebody in Washington at a senior level to call his widowed mother. This proved difficult because these events in Moscow were simultaneous with the so-called “Black Hawk Down” events in Mogadishu, when a number of U.S. Army Rangers were killed. Washington’s immediate focus was not on Russia, it was on Somalia. The White House and the State Department and the Defense Department treated the crisis in Moscow as a second-tier issue that was overshadowed in American public interest by the fight in Mogadishu, the famous or infamous “Black Hawk Down” incident. The President, the Vice President, the Secretary of State and Secretary of Defense were making phone calls to the families of the troops who were killed or wounded in Mogadishu. I tried for, I forget how long, for several hours, to get somebody to call the mother of our casualty. 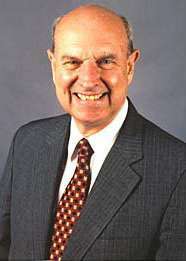 Finally, Strobe Talbott as Deputy Secretary of State did, which I much appreciated. I was quite struck how the attention of senior figures in Washington was not on the crisis in Russia, which we naturally considered the most important event going on anywhere in the world, but on events which attracted more American domestic interest—and of course, American media attention—which was the fighting in Mogadishu. That place was nowhere near as important as Russia, but it involved American fatalities…. In the immediate aftermath of these events, most of the leaders of the opposition were arrested and taken to Lefortovo Prison (at left). The Russian government began cleanup operations, including the rebuilding of the White House. The view in Washington was that Yeltsin had won and that’s good. This was a view with which I strongly disagreed. I acknowledged that, once it came down to a real shootout between Yeltsin and the opposition, it was necessary that Yeltsin win. However, the Clinton Administration saw a victory by Boris Yeltsin as a victory for reform in Russia, that the economic shock therapy we had been advocating would now be carried out and everything would be wonderful. I believed the confrontation had been a disaster for reform in Russia and for Yeltsin’s ability to maintain genuine political legitimacy. People in Russia had felt pride until then that there had been no political violence of the kind they saw in Tbilisi or in Tajikistan. Russia had not been like Romania, but now it was. Russians, regardless of which side they had been on or whether they were on a side at all, felt real shame and disappointment that their country had been reduced to kind of Third World status, with a shootout involving tanks and troops in the middle of the capital. I felt very strongly the episode represented a huge failure for Yeltsin’s leadership and was a huge setback for the development rule of law in Russia. In contrast, Washington was almost ebullient that Yeltsin’s opponents were now in prison while people we liked were the winners; therefore, the policies we favored would be carried out. I can tell you, my view that this victory was Pyrrhic was not welcome in Washington, nor really even within parts of the embassy. People visiting Moscow who heard this view from me were not pleased. They also did not like to hear that Yeltsin’s image among his fellow countrymen, among Russians, had been irredeemably tarnished by his choice of overt confrontation. There was no question the underlying problems of Russian constitutional government needed resolution, but it was Yeltsin’s choice in mid – September to violate the law, to use extraconstitutional means, which placed the burden of the crisis on him rather than on his opponents. Having chosen to abandon the slow process of political compromise, he bore the responsibility for what would come afterwards. That people in the opposition actually initiated the violence and the looting did not, in my view, obviate the fact that Yeltsin set the stage for it. In the aftermath of the very dramatic events of early October, the Russian government scheduled national elections for mid-December to include a referendum on a new constitution, which would be written entirely by Yeltsin’s people rather than reflecting a wide spectrum of viewpoints and political forces. What became known as the “Yeltsin Constitution” was an amalgam of Russian and Western models, but in its essence was patterned on the constitution of the Fifth French Republic written for de Gaulle. There would also be elections for the new parliament, both upper and lower chambers, to be created by the constitution. The lower chamber, the State Duma, was patterned on the German Bundestag, with half the seats elected in districts and half from national party lists. The elections presumed that the constitutional referendum would both pass and attain the 50 percent participation needed to be valid. So, Russians on one day were going to vote for two members of the upper chamber, two members of the lower chamber and the constitutional referendum. In some cases, there would be regional and local elections as well. This was going to be a very big election. Washington assumed the election would be a great triumph for Yeltsin, reflecting his victory in early October, and would set the stage for a vast new wave of reforms favored by the United States. My job during November and early December was to try to convince Washington that such expectations were wrong. It became obvious to me rather early, both from anecdotal evidence and from polling data, that the party led by Gaidar, called “Russia’s Choice” and essentially Yeltsin’s party, was not going to have an easy walk to victory in the election. In part this reflected the popular revulsion against what had taken place in early October, but, even more so, it was due to public unhappiness with government economic policy. 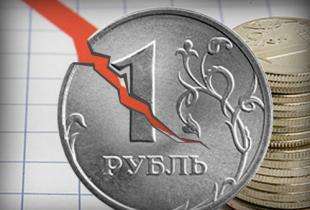 Simultaneous with the political confrontation, the finance minister, Boris Fyodorov, had instituted a very stringent program of macroeconomic stabilization, which had produced a severe tightening of the domestic Russian economy. While the outside world focused on the very visible political events, most Russians were more keenly aware of the sharp deterioration of their economic situation, and particularly that the macroeconomic stabilization program was leading to massive loss of livelihood for urban blue-collar workers. This economic tightening was instituted just as Russians thought things were starting to improve a bit. Russian families had endured a series of economic traumas in the late Gorbachev era, during the breakup of the Soviet Union, and afterwards. By mid-1993, people had a sense the worst was over and now things would slowly get better. Indeed, they had been promised by the Yeltsin government that things were going to get better. Russians would vote in favor of Yeltsin’s constitution and Yeltsin’s party, because Yeltsin had won the political confrontation on the streets of Moscow — had won it with firepower but had won it. They completely missed the fact that what most Russians, not just in Moscow but across the length and breadth of this vast country, were concerned about were their livelihoods, and the fear they were going into yet another period of economic stringency. As the weeks went by, the more palpable was this sense of fear, real fear. This was something I had not seen in 1991 or 1992, but did in late 1993.